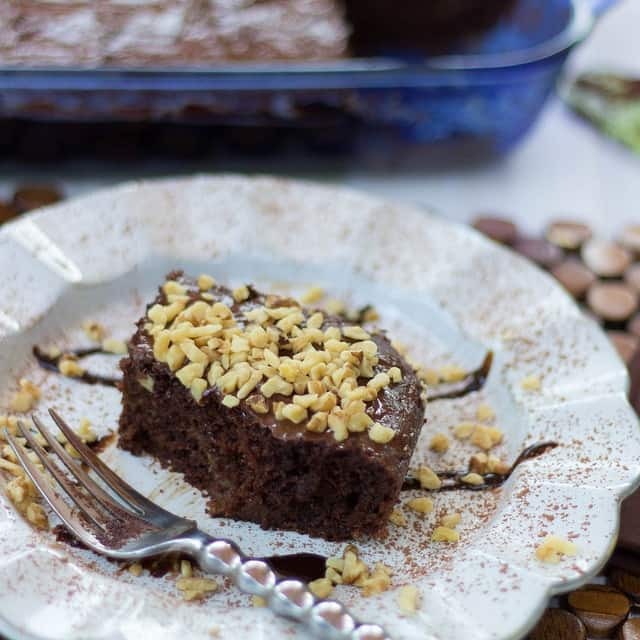 Last year, I thought about making a chocolate zucchini cake pretty much because I thought it’d be an interesting spin on the traditional zucchini bread (which pretty much tastes like cake to me). Does anyone know why it’s referred to as “bread”?? I’ve always wondered that – it’s a lot of banana “bread”, which also tastes like cake. Maybe they get their names because of the loaf formation in which they typically appear? This cake is definitely NOT disguised as bread of any type. In fact, it’s more like an extremely moist “cake-like” brownie. I took the original recipe and upped the zucchini, swapped white whole wheat flour and oatmeal flour for the all purpose flour and also used all vegetable oil instead of half butter and half oil – it turned out great. I also reduced the sugar by 1/3 but would advise those who like their sweets to use the intended amount, which is shown in the recipe below. My girls and their friend could not wait to taste this cake since the chocolate smell wafted deliciously throughout the kitchen while baking. Little did they know, they had a little vegetable with that cake and some whole grains too. Now that put a smile on my face. Add vegetables and whole grains to your cake for a guilt free dessert! In the bowl of a standing mixer, combine the salt, baking powder, baking soda, vanilla extract, sugar, and oil and mix until well combined. Add the sour cream and flours (oatmeal and whole wheat) alternately beating only until incorporated. Spoon mixture into the prepared baking pan and bake for 30 to 35 minutes just until set. Note: chocolate chips will soften but not completely melt. You must gently spread the chips out with a spatula after the cake is finished.